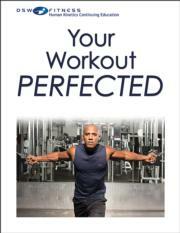 Your Workout PERFECTED separates fact from fiction to improve fitness, function and performance, fat loss, and physique. The CE exam provides certified professionals the opportunity to earn continuing education credits by reading the book and passing the exam. Every workout is intended to do one thing: maximize results. Whether that result is fitness, function and performance, fat loss, or physique improvements, you want your clients’ efforts to pay off. What if you had the opportunity to have the NSCA Personal Trainer of the Year show you how to make every workout better? Now you do have access to that expertise with Your Workout PERFECTED. Nick Tumminello, author of Strength Training for Fat Loss and Building Muscle and Performance, knows that a “one size fits all” approach can’t work for everyone. That go-to program you love may be more harmful than beneficial. But maybe, with some slight alterations, it’s exactly what your client needs. That’s why he developed Your Workout PERFECTED. It’s a unique and cooperative approach—one that works to improve, not replace, your routine. Explain why a client’s training objectives (fitness, function and performance, fat loss, or physique improvement) determine what training program to use. Identify common strength training myths. Explain the exercise and nutrition strategies for fat loss. Discuss the science of strength and apply the associated principles to an exercise program. Choose exercises to improve exercise programs. Describe warm-up and mobility sequences and exercises. Modify exercises to improve efficiency and reduce injury risk. Describe the proper techniques for upper-body, lower-body, core, and conditioning exercises. Describe common ways to create a conditioning exercise complex. Explain the basics of a beginner resistance training program. Explain the basics of exercise programs to improve fitness, function and performance, fat loss, and physique and programs for fat loss. Describe the strategies to minimize exercise-related injuries. A continuing education exam for personal trainers, fitness instructors, and strength and conditioning professionals. Nick Tumminello is the owner of Performance University International, which provides strength training and conditioning for athletes and educational programs for trainers and coaches all over the world. As an educator, Tumminello has become known as the trainer of trainers. He has presented at international fitness conferences in Norway, Iceland, China, and Canada. He has been a featured presenter at conferences held by such organizations as the IDEA Health & Fitness Association, the National Strength and Conditioning Association, and DCAC Fitness Conventions, along with conducting staff trainings at fitness clubs throughout the United States. Tumminello does workshops and mentorship programs in his hometown of Fort Lauderdale, Florida. He is the author of Building Muscle and Performance (Human Kinetics, 2016) and Strength Training for Fat Loss (Human Kinetics, 2014). He has produced more than 20 instructional DVDs and is the coauthor of the National Strength and Conditioning Association’s Program Design Essentials and Foundations of Fitness Programming. Tumminello is also the editor in chief of the National Strength and Conditioning Association’s Personal Training Quarterly (PTQ) journal. Tumminello has been a fitness professional since 1998 and co-owned a private training center in Baltimore, Maryland, from 2001 to 2011. He has worked with a variety of exercise enthusiasts of all ages and fitness levels, including physique and performance athletes from the amateur level to the professional ranks. From 2002 to 2011, Tumminello was the strength and conditioning coach for the Ground Control MMA fight team. He has been a consultant and expert for clothing and equipment companies such as Sorinex, Dynamax, Hylete, Reebok, and Power Systems. Tumminello’s articles have appeared in more than 50 major health and fitness magazines, including Men’s Health, Men’s Fitness, Muscle and Performance, Women’s Health, Oxygen, Fitness Rx, and TRAIN. He is also a featured contributor to several popular fitness training websites. He has been on the advisory board for Yahoo! Health and has been featured in two exercise books on the New York Times–best seller list, on the home page of Yahoo! and YouTube, and in the ACE Personal Trainer Manual. In 2015 Tumminello was inducted into the Personal Trainer Hall of Fame. Tumminello writes a popular fitness training blog at NickTumminello.com.